Madlibs, find the letters of the alphabet in order on signs and license plates, make a sentence from the three letters of license plates, read out loud, follow the route on a map (use post-it arrows). Madlibs are great for the younger elementary school set, and easy for the driver to play along. We have cookie sheets we use for magnets! I bet that would make a nice travel tray–great suggestion! We do travel bags, with special toys only for travel, too. In addition to the ideas listed, I give the kids notebooks (the kind that are $.25 at back to school time) and stickers. Also, we borrow Look and Find books from the library. These are similar to I Spy books, but there are pictures of the items you are looking for (so the kids don’t have to be able to read to do them independently). But what my kids love the most is that I have a central bag with various activities numbered 1 to 8 or so. They don’t know which activity is which number, so it adds an element of surprise. When they start to get bored, I let them “pick a number” and do the activity. I think even my two-year-old would be excited to chose a number between one and ten and then match it to the number on the bag. What a great idea! I expected to get good ideas from this blog post- which I totally did! But it’s always so great to learn something new from the comments too! Thanks to both of you! My toddler will appreciate these tips on our trip in a few weeks! Turn pages and ask, “What color pants is she wearing? What about her shirt? How many people are in that picture? What are they doing?” We easily passed 15-30 minutes that way. We moved on to the airmall shopping magazine and did the same thing. Air sickness bags (sounds gross, but it’s just a provided, clean bag) make great puppets. Get out the crayons and see what they can come up with. By this time, a snack might come in handy. Snack time is its own “reward.” When you finally do have to bring out the toys, bring ONE at a time and try to keep them occupied with it until they completely lose interest. Put it away and bring out just one more, and so on. Lift flap books are GREAT to keep their interest (especially brand new, unfamiliar ones.) We were always able to get them to the point of a nap by doing these things. And when all else fails and an infant or toddler cannot be easily comforted, remember that you’ve done your best and most passengers understand. The few that might be frustrated by a crying, fussy toddler are adults and, frankly, just need to endure it. 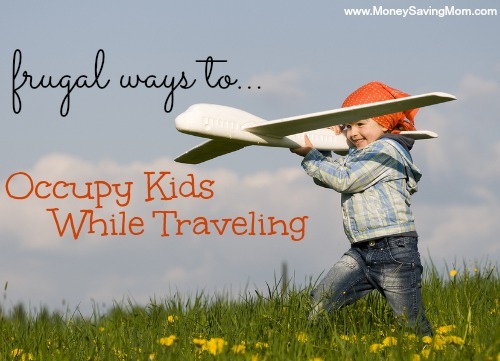 There’s alot we can do to keep our kids happy when traveling, but they ARE kids, after all. Great advice, well said. Wish there was a “like” button. I love how you draw out the fun by being purposeful and intentional! When our daughter was about 18 months, she was scared when we started to take off. Describing (in detail) everything that was happening went a long way to calm her fears! Great ideas! Thank you! We flew cross country with my son at 23 months old. He was in his own seat with a car seat but the trick I learned was to pick a theme he was in and have it all relate. I kept mixing it up on the earlier flight and realized for the way home how to adapt. For example, he loved fish. I had Nemo to watch on the DVD as a backup, had gold fish snack crackers (he does not get these often so it was “new”), I had small fish replica toys (new), fish stickers and coloring books. Keeping the same “theme” helped him for some reason. Just a tip. A theme! Coloring sheets, books, finger puppets–there’s a ton of potential to tie activities to a theme. LOVE IT! If you’re flying on a commercial flight, contact the airine to find out what onboard entertainment is available – kid’s music channel, classical music, inflight movies, etc. A good long-term value is kid’s portable computers, the sorts that help them learn the alphabet, numbers, and sounding out words. – even if they talk to you first, don’t talk for more than a short conversation (but it’s generally up to the parents to remind or redirect the child). As the parents on the trip, there are a few things you can do to make the trip more smoothly. Specifically, bring bribes and helps for the people around out: chocolates, earplugs, maybe buy a snack or beverage if the situation calls for it. And tell anyone in the vicinity that if your child is bothering them and you haven’t noticed, please let you know. Often just showing that you’re aware of what might happen diffuses incipient antagonism. One final tip. As a general rule dads get more slack for dealing with a difficult child than moms. It’s grossly unfair and inequitable but it’s true. Use this to your advantage: if your child is being loud, or fidgity, or sick, or … have dad deal with your child. I agree-a key component of air travel is teaching our kids to be respectful and courteous travelers. We keep ear plugs in our bag to pass out to nearby passengers. If nothing else, it lightens the mood and helps our neighbors to feel considered and respected. Thanks for all of the great info you shared! Thanks for the ideas! We have a 12 hour road trip coming up, so these will definitely come in handy! We also like to hand our ipods over to the kids during trips, they can listen to their own music without fighting and also play their own games! We recently moved across the country and drove 2800 miles in four days with a five month old and a two year old. While we really try to limit screen time at home, I’m definitely not above making exceptions for special circumstances. Electronics are a great way to help them pass the time. Good luck on your trip! We love to travel with balloons. Deflated, they take up hardly any room at all. Then we blow them up in the airport while waiting between flights, in the hotel room, or even in the stateroom on a cruise ship. We never have to worry about them damaging people or property, and we just deflate and toss them when we’re done. Oh my gosh, that’s awful! My children are the the exact ages of yours, but we never let them handle the deflated balloons or play with the inflated ones unsupervised. I suppose if either was a biter or a chewer at all we wouldn’t use them at all. I hope they work well for y’all when you decide to use them! Pipe cleaners. They saved me once or twice waiting at the grocery store line too. oh, I forgot. You don’t have to go out and buy all kinds of trinkets either. Send out a FB notice to your friends asking if they could lend your kids a few items. Mark the items so they eventually get returned to the original lender. Which reminds me…..One helpful thing we moms did for eachother when a family was homebound for a few days or week (think chicken pox). We passed along a Sharing Box. All the kids helped fill a milk crate or packing box with items to lend for the week. Books, movies, toys, homemade play clay. It was like birthdays all year round. I’m definitely adding pipe cleaners to our travel bag! (Do you think they’ll go through airport security? I guess I need to try it and see.) And 50-mile bags and 75-mile pit stops are great ideas! You sound like a very organized and prepared traveler! All great ideas, but one I disagree with “Babies playing peek-a-boo with friendly passenger behind them” Not all passengers are happy to have a small child distracting them from the book they are reading, the conversation they are having or a much needed nap. Just make sure the attention is welcomed. “Just make sure the attention is welcomed”–good point! Thanks for adding that! I was going to say the same thing. If you end up sitting near people who are friendly to your child, great, but never get on an airplane expecting fellow passengers to entertain your child. And even if they are friendly, don’t let your child pester anyone for more than a few minutes. We have driven from NY to WA (and back) twice in the past few years with 4 young children each time. Two of our favorite ideas are books on CD from the library and bubbles. To eliminate the risk of the bubbles being spilled in the back seat, the front passenger holds the bubble wand up in front of the center air blower and it blows a TON of bubbles throughout the vehicle, delighting the little (and older) ones. Magna-doodle. I love those things, and best of all the magnet “marker” is attached with a string! Laminated maps & wet erase markers (we did this for 3yo and up– and still had some stray marker marks, so use caution). They liked seeing where we were going, though. We try to call out interesting sights– cows, trains, horses, state lines, rivers, etc. At every stop, we do a small sweep of all the little toys/crafts that have fallen down and repack everything a little bit so they can reach it again for the next leg. Depending on whether we have a nursing baby or not (I don’t nurse while the car’s moving), we stop every 2-3 hours when the kids are awake for bathrooms, leg-stretching, etc. It makes for longer trips than when husband and I were used to before kids, but it’s really fun to travel with them and experience the trip with them. These are great tips! I packed many of these items for our flights from RI to TX for Christmas last year. I would add that card games like Go Fish, Old Maid, Skip-Bo, and Uno are great for school aged kids. THE MOST important thing to remember is that mom and dad don’t get to check out and relax during the flight. Your child wants your undivided attention and if you stay engaged for the duration of the flight you’ll create some great memories and have a much more pleasant trip (and so will your fellow passengers). We always traveled with the game of Barrell of Monkeys. They still sell it and it is cheap and quiet! Especially on a car ride hang it on the clothing hook up and above and let them watch it move. And on a train. Fantastic toy! I save their broken and dirty toys that are in too bad of condition to donate, such as a Happy Meal toy that is missing parts, books with pages ripped out and taped back in, the 10 last pages of a coloring book, Barbie that got a bad haircut, etc. and pack them up. If a toy gets lost, I don’t have to stress over finding it because it was never their lovee and they still have fun since they have not seen these toys in a while. And you know that you will be buying something new on your trip somewhere so this frees up luggage space since the poor condition toys will not be coming back with you. If your kids don’t swallow things anymore, this is the best travel game kit ever…scroll down until you get to ” travel survival game kit”…. I’ve always found it easiest to make long road trips at night so that my youngs ones would mostly sleep the whole trip. We currently have a 7-8 hr road trip planned for the end of May that will include some daylight hours for my 3 and 4 year olds. I grew up travelling a lot since my dad was military and our family was scattered across the U.S. and my mom said what she did was to go to the dollar store before the trip and buy several toys for my brother and I that she hid until the trip. As we would depart on our long car trip she’d hand us each one toy. Once we got bored, she’d pull out another new one. I’m going to try something like that for my kids for this road trip. Also, my brother and I were pros at road-trip games: the alphabet game (which someone mentioned already), draw a few different random pictures on a blank sheet of notebook paper: maybe a smiley face, a box, and a tree and then take turns making up a story about those drawn items, playing 20 questions, I-Spy (but it must be something found inside the car), the “quiet” game, simple card games like war or go fish, word searches, simple version of pictionary (as someone is drawing an image from their imagination you are trying to guess what they’re drawing before they finish- I imagine this would be quite funny with toddlers/preschoolers), make up a story as a family where each family member takes turns adding onto the story, etc. ****I stock up on Meade notebooks when they are on sale. I give each kid a notebook. They can color, draw, play with tape on the pages, put stickers on it. Best thing for us to take on trips. ****A few small Polly Pockets, action heroes, or soldiers. We love our aqua doodle travel board. I also bought one of those soft car seat travel trays so that toys/crayons/books stay near them a little longer (doesn’t prevent them from throwing it obviously!) I’m not sure I like the idea about the paper to rip up, though…our car seems to create enough trash on its own without the kids helping! In the car, I’ll call my husband’s phone and give our 2 toddlers the phones to talk to each other. Keeps them entertained forever even when they could just turn to each other to chat, there’s something about those cell phones. That’s a fun idea! I know my toddler would love that! -Brush up on lap games and songs! We took painter’s tape once, and it was confiscated when we went through airport security! Isn’t that crazy? I still have no idea why! I am going to dig out some Christmas bows and add them to our bag right away. Our baby would LOVE playing with those! My daughter, age 12, has travelled a lot in her life, both by car and plane, at least 4 times a year ever since she was a baby. And I travel for work, so I’ve had a lot of experience traveling with children, others as well as my own. Don’t take any toys on a plane that are noisy. No rattles! No cutting or other messy stuff, and nothing with lots of parts. And please, none of those little matchbox cars! Not on planes. They end up on the floor, they roll all over, and they’re hard to find and retrieve. Once I sat next to a little boy on a plane once, and his cars would go onto the floor and roll away. I was on the aisle, and his mother climbed over me at least a dozen times to retrieve a toy car. I got really tired of that and went looking for the dang toy car myself. On another trip, I stepped on one (accidentally of course), broke the car and a little boy’s heart. Sorry, but toy cars and airplanes just don’t mix. With all due respect, most of these ideas are really more than you need. The best comment here is from Thar, above. Kids are interested in things that are new and different. Looking through the airline catalog and coloring on an airsick bag is fun for kids. Watching bags being loaded and unloaded is fun. Unless you are in the clouds with nothing to see, looking out the windows is fun. I always try to get a window seat for my child. My advice is to plan on entertaining your child yourself. Don’t just give them toys and expect them to entertain themselves. Drives me crazy on flights to see parents giving their kid toys to play with and then plugging into their music or whatnot and ignoring them. In the car or a plane, talk and play games that involve just thinking and talking. There are tons of such games. Interact with them and they will behave better and enjoy it a lot more. In the car, sing. Great great sing-along CDs for kids are Veggie Tales. My 12-yo won’t admit it, but she still likes singing along to Veggie Tales. We did that just this past weekend while on a 5-hour-each-way car trip to Grandma’s. Even when you are driving, there are games you can play with kids that involve just thinking and talking. When flying, trust me, you really don’t want to be hauling toys and books around. All you need is a favorite toy or comfort item and some paper and crayons or colored pencils. Always label your child’s comfort item with your name, address, and phone number so that it stands a chance of being returned should you lose it. My nephew’s favorite comfort item was a stuffed bunny that got so worn out it looked like road kill, a sure sign that it was dearly loved by a child. Twice it got lost on a trip, and both times it showed up in their mailbox thanks to the kindness of a stranger. Always have snacks available for kids. Always. Grownups too, for that matter, especially when flying. You never know when you may experience delays and be stuck on a plane for longer than expected. I’m surprised to not read more comments about electronics. Most everyone has some sort of electronics nowadays with books, games, and videos. Take your iPad, kindle, smart phone, whatever, take good quality headphones (not earbuds), and make sure you have a way to keep it charged. I’m not endorsing letting children play video games or watch videos for hours on end on a regular basis, but there is nothing wrong with it when you are travelling. If it keeps your child occupied and entertained, so be it. Last Christmas, one of my friends drove with her 8-yo to southern California, about 16 hours from here. We loaned them our entire collection of “Full House” DVD’s, and the child was in heaven. I was on an international flight recently, seated next to a sweet little six-year-old. She had her dad’s iPad, and it was clear that this was a special treat for her. She watched the same Barbie Princess movie about 8 times on that very long flight, taking a break here and there to eat, nap, and go potty. But she was content throughout, and therefore so was I.
I couldn’t agree more. I was on a recent trip from Vancouver to Chicago and twice sat next to two families. The ipad was excellent for the 4yo and I didn’t hear a peep out of him. The 2yo on the other flight had a few books and was asleep. Now, the Chicago to NY flight was different. Dad didn’t do a thing to entertain the kid, she talked in an outside voice (if I can hear your kid over noise canceling head phones and volume on 15, you’re too loud, kid or not). At the end of the flight, the dad apologized to the guy in front of him for his kid kicking his seat the whole time. Kudos to that guy, b/c I would have let my feelings known for someone kicking my seat for 3 hours. An ipad does wonders. There’s a volume setting that will prevent the noise from blowing out little ones ear drums. Use it. No one wants to hear your kid play his video games at 6am. (When I politely asked the parents to turn it down, the father told his son this lady hasn’t had her prozac today. put on your headphones. My retort? WHy yes, I did, but I should have upped the dosage to deal with your poor manners). When we drove on one vacation we made up a game where you made certain noises when you pass certain things, for example: put your arms up and say “whee” when you go under a bridge; when we passed Food Lion grocery stores, they would roar; gas stations say ding ding; hotels, make a snoring noise; restaraunts say yum, yum; etc. This kept their attention for much longer than I expected (and they were only 2 and 4 at the time) and we added more things as we found them. Now they are 5 and 7 and they still like to play this game, especially the bridges) on short trips. We also do I spy and the quiet game like others mentioned and recently, since they are older, we’ve been doing the abc game as “we are going on a picnic and bringing…..” as you repeat and go through the alphabet. I love your creativity! And I love how your games work for the pre-reading crowd. Thank you–I’ll be adding those ideas to my list! We get glow sticks from the dollar bin to entertain our kiddos. They provide so much fun while in the hotel or a dimly lit later flight. For longer flights or car trips I make a treat bag for each kid with a mix of treats and healthy snack and lunch options. I allow the kids to pick and choose from that bag at their leisure. The kids think it is great fun to eat what they want and I don’t have to worry that they won’t be able to eat the on board snacks (due to food allergies) or the expensive fast food available near the gates.